20th January 2009. The new office for processing the Certificate of Registration and NIE for EU citizens opened in Teulada Town Hall. Teulada Town Hall says that this service is also available for surrounding towns. This new service should greatly simplify the procedure for obtaining these two very important documents for EU residents in the area and will hopefully eliminate all the previous delays and frustrations. Congratulations and thank you to Teulada! A translation is provided below of the application procedure. Important to remember is that it is necessary to make an appointment, in the first instance at the SIT office in Teulada or Moraira. APPLICATION PROCEDURE - For NIE and/or Certificate of Registration for European Citizens. The City Council Teulada is collaborating with the National Police - Immigration Office for the processing of Foreign Identification Number (NIE) and the registration and issuing certificates of the Central Register of Foreigners at Teulada Town Hall. This service is provided to citizens of a member of the European Union or State party to the Agreement on the European Economic Area. 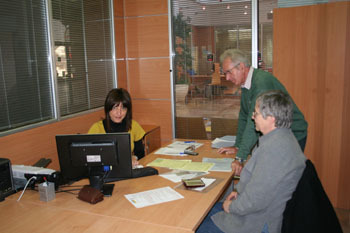 By personal application at the SIT Office (Servicio de Interés Turístico) in Teulada (The Town Hall) or in Moraira (The new Senieta Building). WHERE? The new office processing NIE, located in the Town Hall, Teulada. WHEN? Every Tuesday from 09.00 to 13.00 by appointment. Passport, identity card or proof of citizenship, original and a photocopy. (The identification should be in force, if it has expired, a copy of this and the renewal application). Additionally, in the case of representation by a 3rd-party, a copy of passport of the person concerned authenticated by Spanish Consulate in your country and a general or special power of attorney (original and copy). For a Certificate of Registration of EU Citizen (Resident's Certificate). Passport, identity card or proof of citizenship, original and copy. (The identification should be in force, if it has expired, a copy of this and the renewal application). Proof of NIE (Photocopy and original): The issuing document or Residency Card (Tarjeta de Residencia). In case of not having assigned an NIE prior to the application, this must be applied for at the same time. WHEN? One week after the application. Monday to Friday from 08.30 to 16.00. WHERE? SIT Office (Servicio de Interés Turístico) in Teulada (The Town Hall). DOCUMENTS REQUIRED FOR COLLECTION: Evidence of the application and proof of payment of fees. During the application (explained above), you would be given a form to pay the fee at a bank. Further Information about the NIE and Registration Certificate.